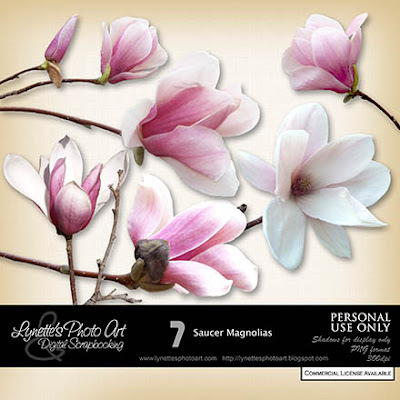 The creamy appearance of the inside of the exquisite Saucer Magnolia blossom reminds me of fine marble. It turns my mind to Resurrection morning and the gleaming angels announcing freedom from death and hell to all mankind for all time - to everyone who will take Jesus as their Savior and live faithfully till the end. The tomb where they laid my Lord wasn't a fine one of marble, but carved of rock into a hillside. "But on the first day of the week, at early dawn, they came to the tomb bringing the spices which they had prepared. and as the women were terrified and bowed their faces to the ground, the men said to them, 'Why do you seek the living One among the dead? The Saucer Magnolia has been a favorite of mine since childhood when I'd walk far out of my way each spring day just to past one on my way home from school. Thank you for sharing your talents Lynette. Your flowers are just awesome. Have a Blessed Easter. Thank you! Your blog post will be advertised on the DigiFree Digital Scrapbooking Freebie search engine today (look for timestamp: 11 Apr [LA 07:00pm, NY 09:00pm] - 12 Apr [UK 02:00am, OZ 12:00pm] ). 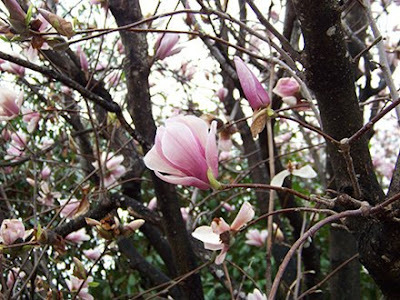 Thank you for the lovely magnolias. May your Easter be especially blessed. Thank you ever so much to share with us some of your favourite flowers ! Thank you so much for sharing. Have a Blessed Easter. Thank you so much for this Freebie. I want to let you know that I posted a link to your blog in Creative Busy Hands Scrapbook Freebies Search List, under the Elements Only, Papers Only post on Apr. 12, 2009. Thanks again. thank you there are wonderfull! Love the flowers; thanks so much!